Fresh, locally-grown, grass hay is available for pickup every Sunday from 4:00 – 4:30PM. Call 608-509-4774 (this number is for hay inquiries only) or email hay@wisconsinhrs.org if you have any questions. Please bring your own container; a 19-gallon tote, or larger, works well (may have a little overflow). All proceeds support WHRS foster care. Bunnies need unlimited hay for optimal health. Hay provides entertainment, as well as an essential fiber source for proper digestion. Its long strands help propel ingested fur through the intestinal tract. Grass hays (ex: timothy, orchard, brome, oat, marsh) are preferred because they are lower in calcium and protein. Alfalfa and clover hays are fine for dairy cows, but are too rich in protein and calcium for house bunnies and can cause health problems. However, any hay is better than no hay! Loose hay is better than pressed blocks because the long strands helps propel fur through the gut. Hay in a litterpan also encourages good toilet training. Please note: the hay we sell is a grass hay without alfalfa or clover. We guarantee that it will not be damp or moldy, that it will not have excessive amounts of weeds (no more than 10%), and that it will have some ratio of green to brown that will necessarily vary with the season. Unless the hay you purchased from us has one of these problems, it cannot be exchanged or returned for a refund. We cannot guarantee that your rabbits will eat the hay, because a rabbit can reject his/her hay for lots of reasons having nothing to do with the hay we are selling. 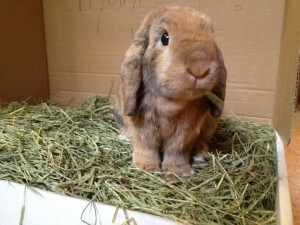 Also, rabbits will naturally pick through hay and select some stalks/leaves, usually the green ones, and reject others. That’s what they do. Hay should be stored indoors, at room temperature or cooler in a dry location out of the sunlight, which can leach nutrients. Choose a container that is not airtight. The hay needs to breathe—so do not put it in plastic bags. As it still has about 15% moisture content, a sealed bag or airtight container can cause harmful mold.